I have been a professional journalist for over 10 years and have been active in the NUJ for most of that time. I’ve worked in Ireland and the UK, worked as a new media journalist in broadcasting, as a freelance and in the NGO sector. I’ve been a rep at chapel, branch, industrial council and NEC level. The media is changing; the NUJ needs to change with it. The union needs to regroup, to move from fighting reactive campaigns against what the bosses are doing and provide stronger support to our members in taking greater control of their own work and workplaces. We are not just fighting for our jobs; we are fighting for the future of journalism. The current ownership model is broken. Unless real alternatives are found and put into practice, the entire industry is in real trouble. Radicalise – in recent years, the union has fought back against the worst aspect of the cuts with strong pockets of resistance. But we need to move on from rearguard actions to prevent compulsory redundancies and tackle the media ownership models full on – seeking to replace what’s broken with models that work.We need to co-ordinate action across the union, we need to fight for every job and we need to take control of the media back from the bosses who are destroying it. Renew – the media is changing; we need to ensure that the NUJ is, and continues to be, fit for purpose. We can’t continue to do things the same way because that’s the way we’ve done them for years. We need to look at our structure, our membership criteria and our communications to ensure that they contribute to building the union and serving our members. Recruit, recruit and recruit – there’s only one way to bring the union out of its current financial difficulties and to build the strength of the union and that’s to recruit more members. We’re losing a lot of members as cuts reduce staffing levels. We need to recruit more and more new members to replace them, while also continuing to provide support and training for our members who are losing their jobs. Many of the members we’re losing pay the top rate of subs, many of those we recruit pay the lowest levels, so we need to recruit two members for everyone one we lose to keep the union’s income steady. Every member needs to take responsibility for recruitment, but the union’s leadership can do more to help members. In the last year, the Development Committee – of which I’m currently Chair – has prioritised improving recruitment in the union. With the Training Department, we’ve organised training in organising for recruitment for NEC members. As a member of the New Media Industrial Council, I played a key role in the new media research project that will identify key targets for recruitment in the new media sector. These efforts and others will start to bear fruit in 2010 as long as the focus on recruitment is maintained by the union’s leadership. As Vice President, I would ensure that this happens. 1991 – Started working as a runner in RTÉ Sport during the summers holidays from school, returned each summer until 1994. 1994 – Began BA in Journalism course in Dublin City University. Joined NUJ as student member. 1995 – Began working evenings, weekends and holidays in RTÉ News as a news assistant while in university. 1996 – Published first issue of student music magazine, Sorted magAZine, produced with classmates. Edited subsequent editions, which were online only (magazine ended in 2004). 1998 – Lived and studied in Paris for 3½ months, graduated university (September), began career as Online Journalist with RTÉ News Online website (October). Became full NUJ member. 2000 – Promoted to Senior Interactive Journalist of RTÉ Interactive News website. 2001 – Acted up as Producer/Editor of RTÉ Interactive News website from May. Led formation of RTÉ Interactive Chapel and elected Father of the Chapel; subsequently elected Secretary of Dublin Broadcasting Branch, Dublin Broadcasting representative on the Irish Executive Council (IEC); nominated as IEC representative on the Online Media Joint Council (where I was elected Chair). 2002 –Resigned from RTÉ and moved to London. Worked as freelance, including writing column for Irish language magazine Comhair; volunteered with CND. Elected as IEC representative on Broadcasting Industrial Council. 2003 – Worked as a temp with Edexcell website team for six months, started work with Amnesty International as editor of news.amnesty website (October). 2005 – Elected New Media representative to the National Executive Council and London representative to New Media Industrial Council. 2006 – Became Senior Editor of http://www.amnesty.org website. 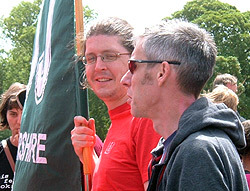 2008 – Elected Chair of the NEC’s Development Committee. 2009 – Running for Vice President of the NUJ. It seems that I just came across your blog at a good time. (You might remember me from hanging out in Fibbers in the mid 90s). Would I be correct in thinking we (Olivia, me and a friend) slept on your floor one night before heading down the country?